A paint pen, sometimes called a marker pen, is a writing instrument designed to create permanent writing on various surfaces of objects. It has its own ink-source, and usually a tip made of a porous material, such as felt or nylon. The solidified paint pen is a type of paint marker, which is suitable for marking on wet or oily surfaces, leaving a mark similar to that of chalk. 2. The paint pen uses imported paint, ink for strong adhesion and great color fastness. 3. 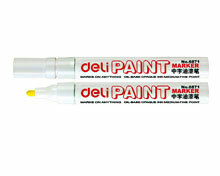 The marker pen is suitable for marking on the surfaces of all solids, such as metal, glass, plastic, rubber, textiles, etc. 4. Our product has passed EM-71 Euro environmental certification, safe and no-toxic. As a specialized paint pen manufacturer and supplier in China, we at Deli Stationery also produce other office supplies such as paper punch, binder clip, desktop set, pencil case, pen bag, clipboard, etc., in addition to our writing instruments. High quality and economically priced, our products are extensively used in banks, enterprises, governments, schools, hospitals, and more. We invite you to contact us for more product information.